Sonos players are always on. And they draw considerable power. I have compiled a small spreadsheet that helps you calculate the yearly cost for your Sonos household. It works with the numbers Sonos published for 230V. The HomePod uses between 1.7-1.9 watts while idle, that's quite a difference compared to the Play:1 / One. The consumption of the Play5 2nd gen is also quite interesting, uses a quarter of the Play5 1st gen and even less than the Play1/One while being considerably larger. 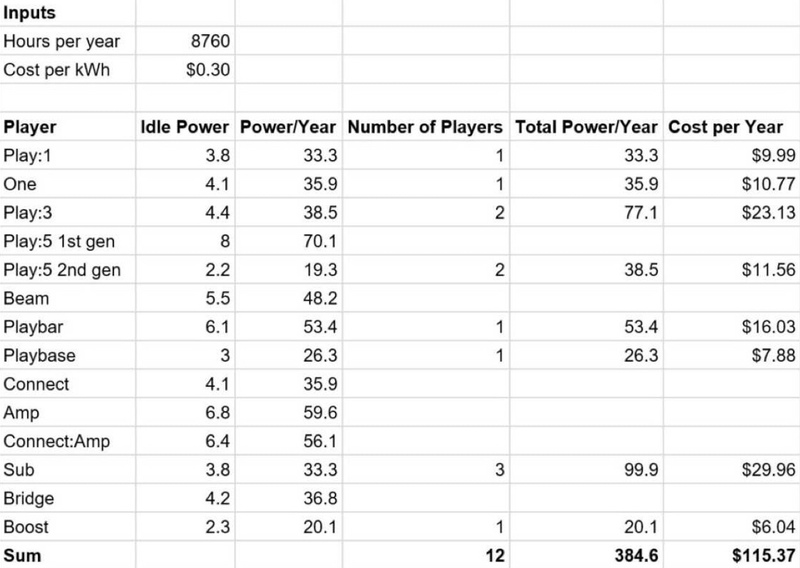 A spreadsheet with the consumption while playing would be interesting, HomePod uses 9.25 watts. HomePod power consumption, as with every speaker, depends on the volume you play it at.